Today was gorgeous. It was 71 f. with crystal clear blue skies. This is way out of the norm for central New York in November. Inspired by the weather, I went for a long walk with my lab Kate. I needed to get out and do something that would bring me some happiness and walking Kate has a 100% success rate. Yesterday in my class I showed a grim documentary about Willowbrook Institution. The only way to teach this topic is to get upset. I had to be outraged to be effective. I thought about what I would say to students while I looked at photo after photo of what Robert F. Kennedy called a "snake pit". Deeming Willowbrook a "snake pit" was being kind. It was a hell hole and a national disgrace. Few of the students had heard of Willowbrook. Few knew the long history of institutions; none had any idea ugly laws existed. The students were aghast. So was I. Back to today. 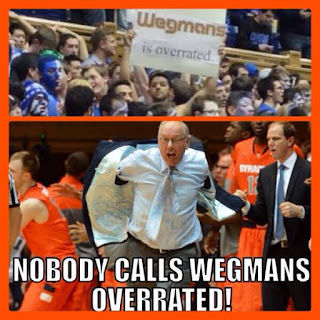 Post walk, I went to Wegmans, a supermarket chain in the Northeast, that has a cult like following. Above is a sign Duke students created when they played Syracuse (the rivalry between the schools is intense and is big time NCAA sports). 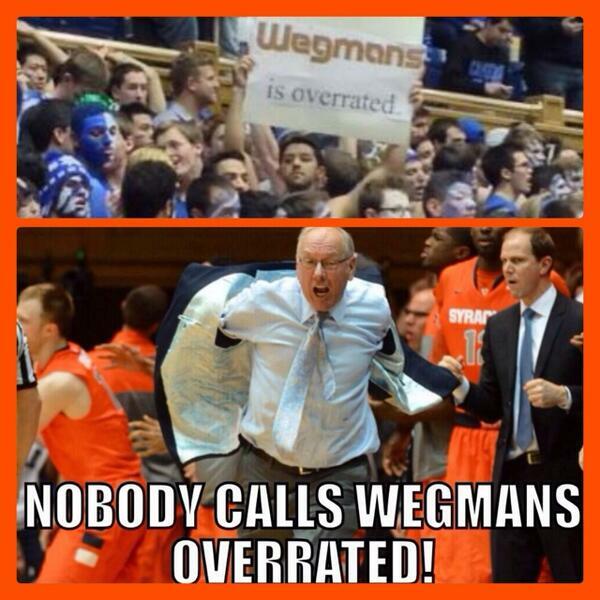 I thought the sign, "Wegmans is over rated" was funny. I will confess I love the supermarket chain and decided to pick up something special and cook outside. All was well until I went to my car after shopping. I was a trying not to drop to my grocery bag when out of the corner of my eye I saw a car slowly backing out. I instantly knew the car was going to hit me. It was a silent Prius and I instantly thought of Steve Kuusisto. Silent cars are potential killers, a very real threat to blind people. My next thought was to stick out my hand, put it on the rear bumper and push really hard. I dropped my bag as I propelled myself backwards out of harms way. I was not in any real danger and thankful the elderly woman driving the car was going very slow. The driver realized she had almost hit me and stopped the car. She got out of her car and was clearly annoyed. Her first words out were "You can't be out by yourself. Where is your care taker?" I took a deep breathe and told myself the woman is elderly and her perception of people with a disability is antiquated. I replied "I am ok. I am going to pick up my groceries." She sort of huffed at me and said nothing as I picked up my groceries. Once I had my things together she had regained her composure and firmly stated "You shouldn't be allowed out by your self." I told myself to keep my mouth shut. Let it go. Cut the woman some slack. She's old, she was embarrassed, and there is nothing to be gained by engaging her. Society has progressed I thought. Only an elderly person would state something like this. Perhaps she lives in a nursing home and knows some residents are not allowed outside the grounds without another person. Let it go. Inventing things to do so I could enjoy being outside before I got in my car I decided to open the hood and pull the leaves out of the area between the hood and windshield. As I was doing this I saw a woman about to pull into the empty spot and we looked at each other. I pushed to the front of my car and the woman continued into the spot. I was relieved. Normalcy won the day I thought. I was an ordinary person after all. One little old lady does not represent the way all people perceive me. Better yet the woman had a small child in the car kindergarden age. I give the mom and child a broad smile. I said "Hi I'm Bill what is your name?" She replies "I am Elsa. What are you doing?" I replied "I am taking the leaves out of the car." Her mind was whirring. She was curious, thought a second and said "You can't". Puzzled, I told her "Yes, I can. It is easy and fun to take the leaves out". Then she said "No you can't. You can't do a lot of stuff." Her next words took me aback. "You can't walk. You can't do anything. You can't even have fun". At this point I looked at the mother and her face was neutral. I told the small girl "Have fun shopping with your Mom". It is seemingly inconsequential exchanges such as the one I just described that keep me up at night. This girl had absorbed some lessons about people who use a wheelchair. Those that use a wheelchair simply can't do a lot of stuff. Did she learn this at school? At home? She was very clear on can't. I can't do a lot of stuff. Her mother did not correct her. Did she too share the belief I can't do a lot of stuff? When will this change? When will people consider disability, in my case wheelchair use, simply a part of life? Instead, the norm is to think of all the things I can't do. At the forefront is the physical deficit. Obviously I can't walk and the next thought is what else can't I do. Disability is bad, a negative influence on life that limits me. Why can't people make an intuitive leap in logic. Here is a middle aged guy doing the ordinary. Shopping, cleaning leaves out of the hood of his car. Ho hum. Instead the unrelenting focus is can't. The girl has learned her lessons well. The above is a simple social exchange but it has larger implications. The instant negativity attached to disability is raised to a higher level when serious, life threatening illness is at issue. Cancer is bad. All illness is bad. Terminal illness is the worst--a tragedy. Terminal illness is the worst because our very existence is threatened. For some, the response to mortality is primal fear. Fear I get. I have felt primal fear and have had life threatening illnesses. I have almost died more than once. Primal fear however can be overcome with reason. This is hard to do. It is far too easy to let fear grip us. It is easy to think of all the things you can't or will not be able to do when end of life approaches. For example, Brittany Maynard was gripped by fear after she received a terminal diagnosis in the form of an aggressive and fatal brain cancer. Maynard chose to let her fear (understandable for sure) dictate her death. Indeed, her lasting legacy is less about her life than it is about her death or her "gentle passing" in the words of her widower husband Dan Diaz. As most know, Maynard became the focus of an intense and superbly orchestrated public relations campaign waged by Compassion and Choices. There is no doubt Maynard became the poster child for so called Death with Dignity legislation. Thanks in large part to her activism assisted suicide is legal in California. The end of life, like disability, discussions are emotionally charged and focus on one thing: loss, or in the words of the little girl I met today, can't. There is nothing positive about the end of life. There is nothing positive about disability--you simply can't do anything. Both end of life and disability are about the loss of control. The loss of dignity. The loss of autonomy. End of life and disability are life altering for all involved. Maynard husband stopped working after two decades and is now an advocate for Compassion and Choices; a radical shift he maintains honors her life. I find this sad. Maynard is largely known for one thing--her death. I for one prefer to think of death as a process we all will navigate. That process should be about life, a celebration of what a person valued. Life does not end with a terminal diagnosis just as life does not end when one acquires a severe disability. I never think about what I can't do. I don't think my life is tragic. I don't wish I was dead--something strangers ask me. My focus is squarely on life. Maynard's focus was squarely on death. If I fear anything, it is people like Maynard. People who can't handle the process of death and instead focus on a "gentle passing". Oh the euphemisms abound when when death with dignity is discussed. Lost in the shuffle are people not as privileged as Maynard. Vulnerable people abound. Vulnerable populations are at risk. People with a disability are at risk. I am at risk. Read my essay in the Hastings Center Report entitled "Comfort Care as Denial of Personhood" published in 2012. I wrote about being offered assisted suicide an experience that haunts me to this day. For a person who is vulnerable such as myself I have good reason to fear for my life--a fact Compassion and Choices and those who support assisted suicide dismiss without much, if any, consideration. We face a great challenge in that society refuses to provide the necessary social supports that would empower us to live rich, full, and productive lives. This makes no sense to me. It is also downright dangerous in a medical system that is privatized and supposedly “patientcentered”— buzzwords I often heard in the hospital. It made me wonder, how do physicians perceive “patient-centered” care? Is it possible that patient-centered health care would allow, justify, and encourage paralyzed people to die? Is patientcentered care a euphemism that makes people in the health care system feel better? When hospitalized, not once did I feel well cared for. All I felt was fear, for when it comes to disability, fear is a major variable. I fear the total institutions Erving Goffman wrote about—places where a group of people are cut off from the wider community for extended periods of time, and every aspect of their lives is controlled by administrators (nursing homes, prisons, hospitals, rehabilitation centers). I do not fear further disability, pain, or even death itself. I fear strangers—the highly educated men and women who populate institutions nationwide. What I experienced in the hospital was a microcosm of a much larger social problem. Simply put, my disabled body is not normal. We are well equipped to deal with normal bodies. Efficient protocols exist within institutions, and the presence of a disabled body creates havoc. Before I utter one word or am examined by a physician, it is obvious that my presence is a problem. Sitting in my wheelchair, I am a living symbol of all that can go wrong with a body and of the limits of medical science to correct it. I suggest one can replace the word disability used in the above quote with the word terminal. Euphemisms are dangerous. For example, legislation that enables one to access a lethal prescription is called Death With Dignity or Physician Aide in Dying. If we are going to let people legally commit suicide let's not mince words. It is assisted suicide legislation we are discussing. It is knowingly ending the life of a human being. I plan on living in my atypical body as long as possible. I like my body very much. I do not care about my body's obvious and disruptive dysfunction. I do not care about the pain I feel. I do not care about the spasms that wrack my body. Think Dylan Thomas Do not go gentle into that good night. A great poem for sure but for my taste think Pablo Neruda Only Death. as though we lived falling out of the skin into the soul.